New Winter 2018: This bright, colorful girls ornament will delight a gal who has recently begun to apply a touch or two of makeup! 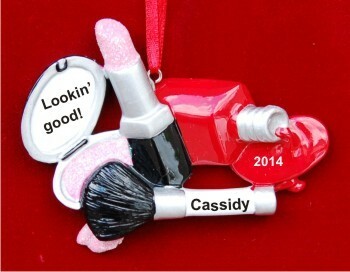 The always looking good personalized Christmas ornament features a spilled bottle of nail polish, lipstick and a makeup compact and brush. These are girls ornaments personalized with her name and a sentiment from you. Our artists paint on the information in a stylish font that creates a unique gift to put a smile on a young lady's face. Celebrate her coming of age with a gift she'll look back upon with fondness, the makeup collection personalized Christmas ornament in our plush velvet gift and storage pouch.